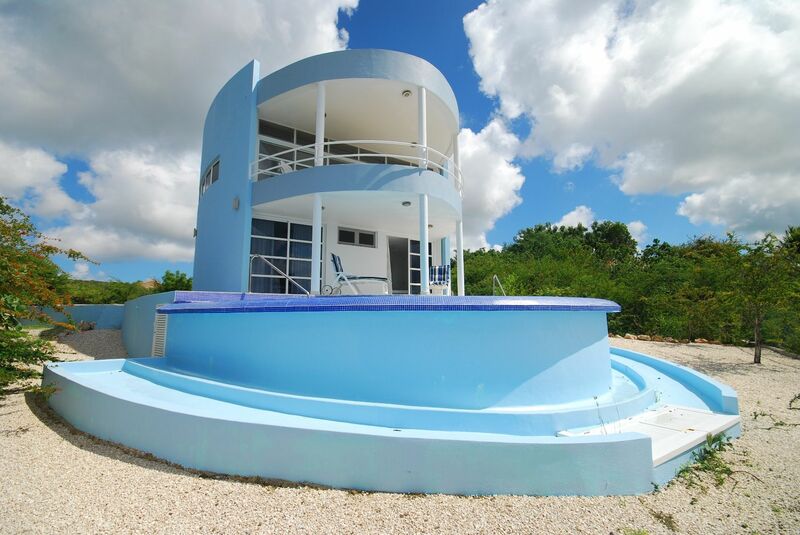 Modern architecture in the Caribbean in the color of the Caribbean sea; that is the unique Blue Oval House, located in the upscale area of Sabadeco’s Crown Court. Follow the drive way to the oval shaped villa and experience the feeling of total privacy at the property. 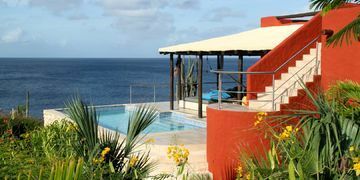 From the pool deck with infinity pool you will have incredible views over the island and the ocean. Chill and relax on the pool deck on one of the lounge beds while sipping a tropical cocktail. The sliding doors from both bedrooms on the ground floor open to the pool deck, both equipped with air conditioning, ceiling fans and queen size double beds. Follow the stairs to the first floor, open the sliding doors and be surprised about the great panoramic view! By opening these doors, the balcony and the spacious living area with fully equipped kitchen will be one large, open area. The perfect spot to sit, relax and to enjoy time with your loved ones. The master bedroom with en suite bathroom is located on the second floor, equipped with a king size double bed and air conditioning. 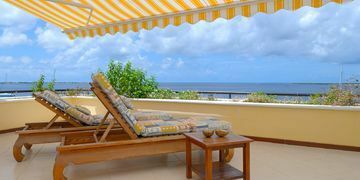 Enjoy the free WIFI throughout the whole villa or watch your favorite program on the television offering most international channels. Feel free to use the washing machine you will find in the laundry room.